OK, I admit it’s not a great photo. What I was trying to show here though was how thoroughly the army ants at the raid front carpet an area, looking for prey. They go in, under and over everything. I usually just step over the raid trails when I encounter them. In this case though, they were very thoroughly blocking the trail I was on. I eventually tip-toed through them, followed by some vigorous foot stomping. Seeing a raid front really is quite a spectacle though. 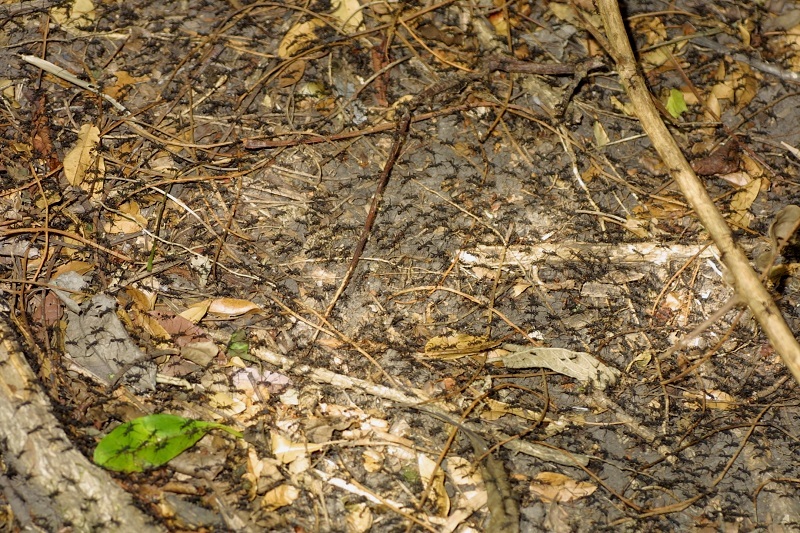 There are often antbirds flitting around, and it’s amazing to see all the stuff that the ants scare from the leaf litter. I’ve been surprised by just how many hidden critters are suddenly forced into revealing themselves. As potential prey flees the ants, you can’t help but notice how some are immediately set upon by parasitic flies.